The SCIS team extends greetings and best wishes to school library staff everywhere as International School Library Day 2010 is celebrated today in Australia. This year’s theme reflects well the reality of students, schools and collections diversifying, of the challenge of new buildings and technologies, and of the resilience required by library staff, systems and associations. It also reminds us that good school libraries deliver positive outcomes in so many areas: cultural diversity, multiliteracies, literature and community learning. 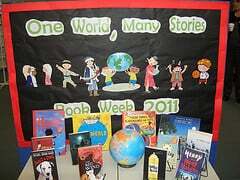 Further information about International School Library Month is available from the International Association of School Librarianship and 2010 Coordinator Marie O’Brien. A number of celebration events and awards are part of this significant day. Congratulations to Janice Wilson from Lake Tuggeranong College, ACT for winning the Australian Teacher Librarian of the Year 2010 awarded by the Australian School Library Association (ASLA) and Pledger Consulting (LinksPlus/Weblinks). Described as a curriculum leader and effective manager in a very complex school library-public library environment, Janice exemplifies the criteria for this award as an exceptional Australian teacher librarian in a school setting whose professional practice has a positive impact on student achievement and information literacy. ASLA describes the role of a teacher librarian as having three key professional specialisations: curriculum leader, information specialist, and information services manager. NSW Teacher Librarian of the Year 2010 is Elizabeth Greef, St Andrew’s Cathedral School. Elizabeth’s citation refers to her work managing the resourcing of new programmes in the school including the International Baccalaureate and Gawura, the school’s indigenous program. WASLA is holding an International School Library Day dinner in Subiaco tonight to celebrate the announcement of awards. SLAV celebrates today by inviting you to join in an Elluminate online webconferencing session at 11.00am (AEDST – check your time zone here) to launch the 2012 National Year of Reading (NYOR). Get your headset on, follow the link to Elluminate and join Sue McKerracher who will present details of the NYOR and the promotional material that is available for you to use in gaining support and interest at your school. So how did you spend International School Library Day? We’d love to hear about it.